The use of 42mm T-thread for the coupling causes a choke-point in the imaging train (typcially 38mm internal diameter), possibly resulting in vignetting in fast systems. High resolution digital image sensors and their protective glass covers are highly vulnerable to dust that can enter the body each time the camera is coupled/uncoupled, or in open systems, particularly if the camera has been modified for full-spectrum use. Many cheap T-rings are mass-produced for generic camera use, with general manufacturing tolerances and design, which result in a potentially loose bayonet fit that can cause focal plane squareness and long-exposure image shifting from lateral play and angular wobble. Baader's New Protective Wide T-Ring System for the Canon EOS series cameras evolves the T-Ring and solves these issues. The 2" wide aperture of the protective T-ring accepts 3 different attachment adapters, which are included with each T-ring: Standard T-thread (42mm), 2" thin profile nosepiece, and 48mm thread (astro filter standard). 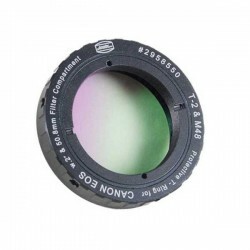 The internal filter compartment is able to accept both Baader 2" mounted filters, and 50.4mm diameter unmounted filters for the widest clear aperture possible (47.3mm aperture). The optimized design and tight manufacturing tolerances ensure the closest fit possible with the Canon EOS body. This avoids the occurance of focal plane tilt and image shift caused by play and wobble at this connection point. In addition to the basic system, this Protective Wide T-Ring system also includes a pre-installed Baader 50.4mm x 3mm UHC-S Nebula filter.